I recently took advantage of a day in London to do something that I have been meaning to do for 40 years, but have never quite managed to accomplish. And that is to spend a day randomly walking and exploring the Center of the World, Greenwich England. Greenwich is (technically) a part of greater London, located east of the city, south of the Thames, and it is easily accessible by bus, by ferry, by car, National Rail, or (as I did it) by the DLR (Docklands Light Rail) from where I was in Shadwell. From The City, you get on the DLR at Bank or at Tower Station. 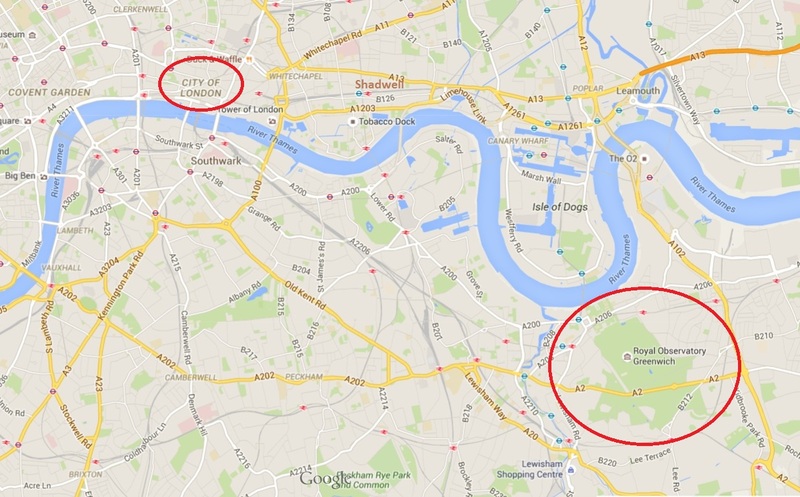 I find it very easy to make a great distinction between London and Greenwich. London of course is a city of history, of impressive architecture, of the Royal family, and of the names and sights that everyone knows and recognizes. When you think of Trafalgar square, Buckingham Palace, Big Ben, Sherlock Holmes, and Abbey Road, you are thinking of London. Greenwich is much more specific, much more focused. Yes, there are beautiful buildings and Royal influences, but the focus of Greenwich is on the history of England’s marine traditions. England’s Navy, her merchants, the history of worldwide trade, of global navigation, and (of course) Greenwich is the home of the Prime Meridian, the invisible line that every time zone and location on earth measures itself to. 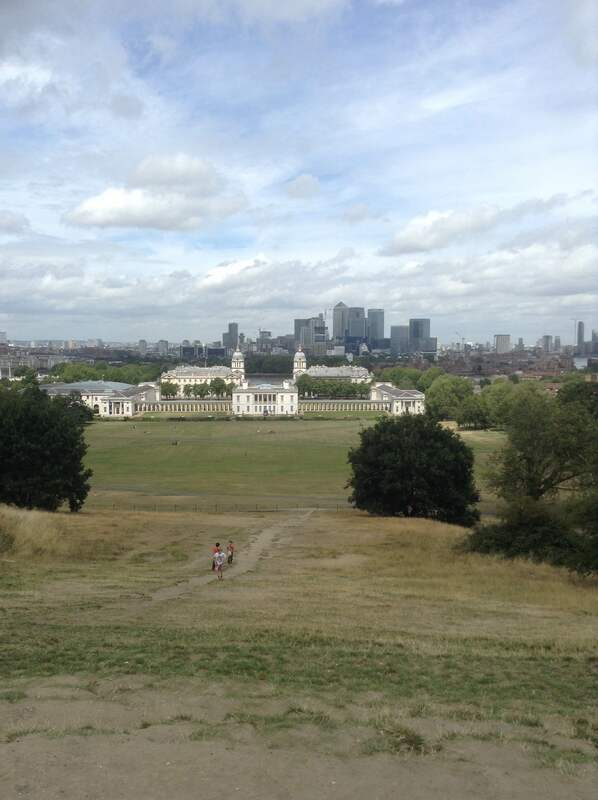 It’s not an exaggeration to say that Greenwich really is at the center of our physical world. My exploration of Greenwich involved one day, but was divided into 3 portions, first exploring Greenwich Park, second was the village, and finally the historical sites and grounds. Fair warning, the first portion of this day (exploring the park) was moderately challenging, involving about 6 miles of walking (some of it quite steep), many areas are not handicap accessible, and my walk would not be suitable for all. The rest of the day (the village and the historical sites) was mostly on level ground, along paved or smooth footpaths, was reasonably easy to walk, and was 100% handicapped accessible. 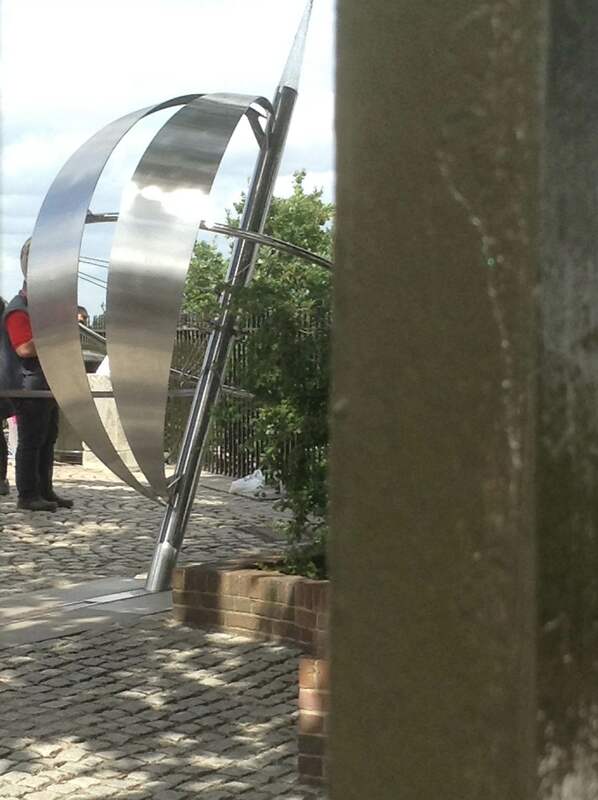 From the start then… I took the DLR from Shadwell down to the Cutty Sark station in Greenwich. The DLR uses the same Oyster card as the London tube and bus systems, and from the Shadwell DLR station no train changes were required to get to Greenwich. There are actually 3 ‘Greenwich’ stations to choose from, Cutty Sark, Maze Hill (National Rail), and Greenwich. However, I do not suggest using the Greenwich or Maze Hill stations for tourism. Cutty Sark is the ideal station for most visitors. It is right down in the center of the old town and it is the closest station to the river and all of the historical sites. And no, the station is not named for the whiskey. It’s the other way round. The whiskey (and the station) are both named for the Cutty Sark, a 210 foot long 3-masted late 1800’s vintage clipper ship, which is one of the truly great and unique attractions in Greenwich (more on that later). Looking left I could see a rather imposing stone arch, and a large grassy area beyond it. Since it was exactly opposite of McDonalds, my feet led me in that direction, a short walk down a crushed stone pathway to where I soon spotted a tourist information center, and a café where I could get a cup of coffee. Perfect! I ‘contributed’ two pounds in the voluntary donation box and picked up 4 quick guides to Greenwich. As I drank the coffee, I looked over the guides and quickly decided on the scenic walking tour as a good start. I love to walk, I am a fast walker, and I knew I would only be ‘loosely’ following the guide suggestions. But that guide did have a map that would be perfect for what I needed, and it highlighted some spots with excellent views. I’ve added a Red trail to (basically) indicate the actual path that I did walk. Not exactly their suggested path, but then again I grew up reading Robert Frost, the American poet who talks about travelling the path less well trod, “and that has made all the difference”. 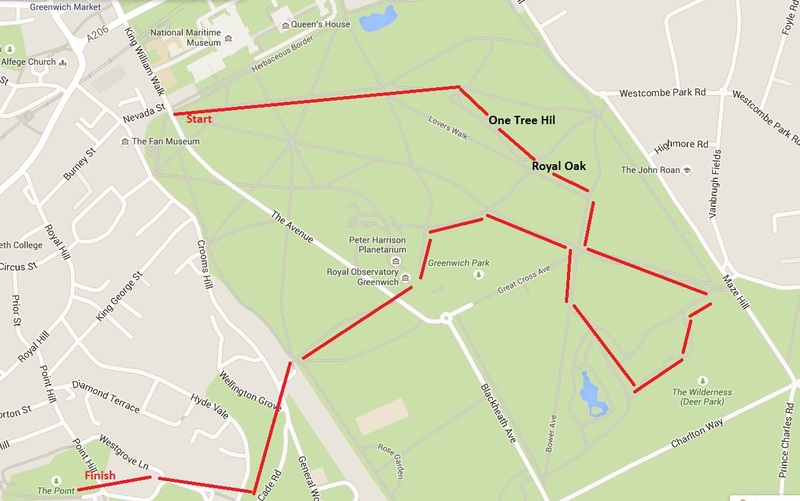 Starting from the north-west entrance of Greenwich Park, I walked on a paved path that headed east across the northern edge of the park, aiming for the top of One-Tree-Hill. This was a location I knew about from some rather famous paintings, and was a specific spot I knew I wanted to visit. It was a nice walk, and plenty of people were out in the park sitting on picnic blankets, playing Frisbee, or walking and exercising their dogs. Only the last 200 yards of actually climbing the hill was steep, and at the top the view was well worth the climb. Also up top are a nice set of benches under the shade of a chestnut. Yes, well worth the hike. Between One Tree Hill and the observatory, I made a really long detour to spots that looked like they might be interesting. 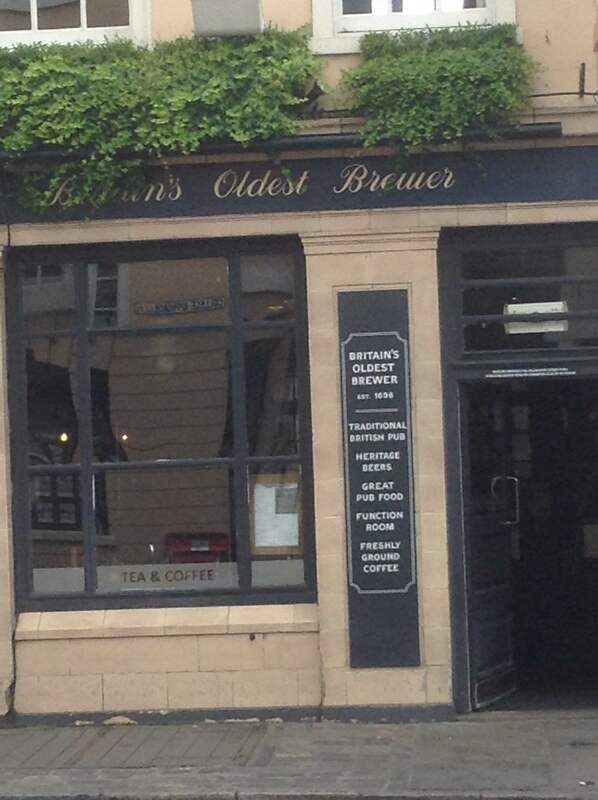 The first was the Royal Oak. OK, yes, that does sound odd, a Royal Oak? But there is some history here that really opens your eyes. Lying on the ground here is a 4 foot wide 30 foot long section of an oak that fell in the 1990s. So what? Big deal. Right? Wrong. 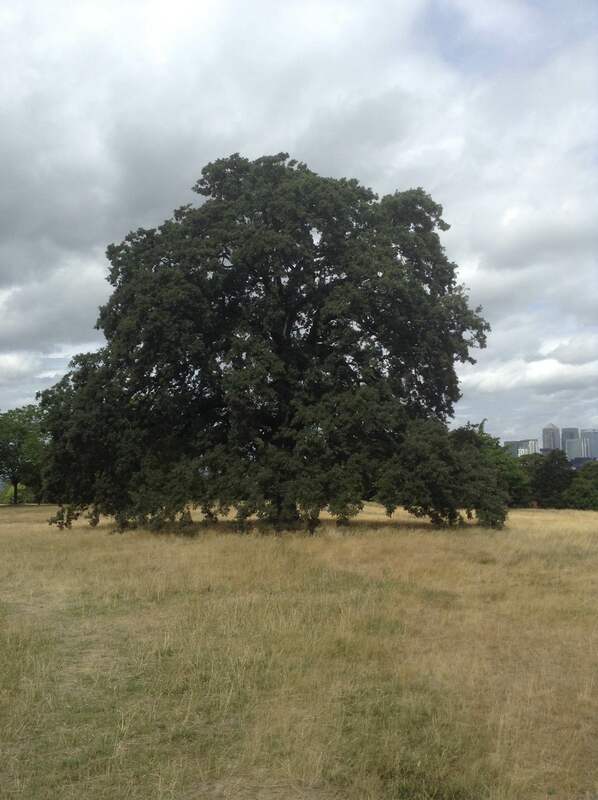 That oak tree was alive during the reign of Queen Elizabeth-I, who was born in Greenwich castle in 1533. And right next to this fallen log there is now growing a new oak, planted by HRH Prince Philip, the husband of Queen Elizabeth-II. Above and beyond the Royal Oak is the small and rather unimpressive site of a Roman temple ruin. It is really nothing more than a few stones, something you would quickly walk past without noticing. Of course this location for a Roman temple makes perfect sense, this might be the highest ground elevation anywhere near London and it certainly has a view of the river valley. I can only imagine what it was like 2000 years ago, when trees and forests still covered this area. Looking at this site served as a reminder that while we think of London as modern, or sometimes we reflect on her great glory from 1600-1900, there was the even older Londinium before this. 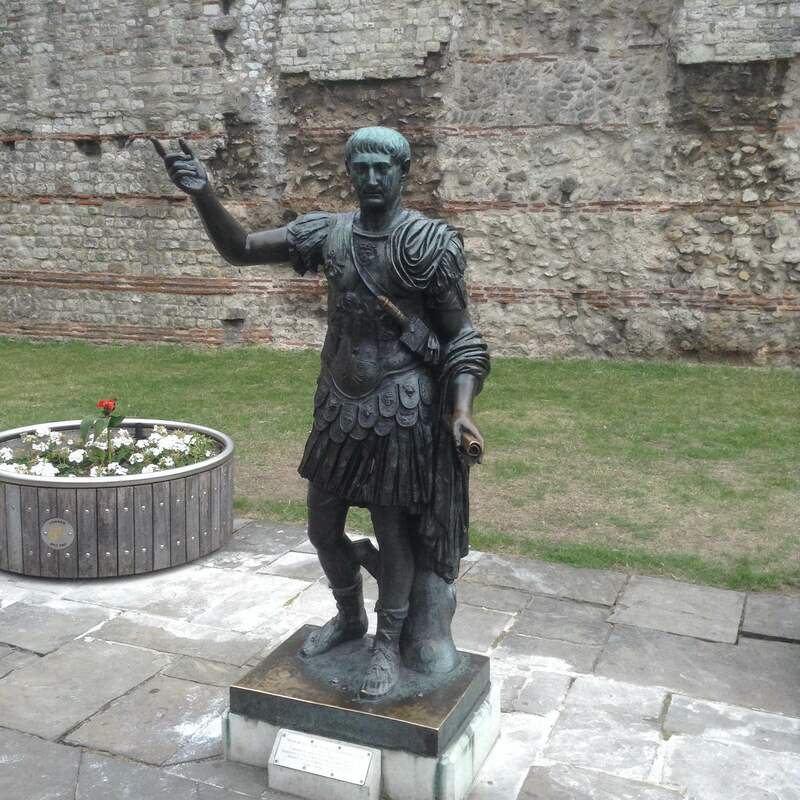 These Roman reminders do pop in a few places in and around London (like the section of Roman wall near the Tower), but they are very rare and are always worth a stop. I know I was heading the wrong way, away from the Observatory, but it was a pleasant day, and I was so close now that I had to keep walking until I reached Deer Park. What did I expect? A few fenced in acres, some deer running around, some birds, trees, and not much else. Pretty much, that’s what it was. Deer Park is small, and having lived in Maine for many years, deer are not much of a novelty to me. But if you have never before seen one of England’s famous red deer, this is probably your best bet outside of a zoo. These are nothing like the white-tail or mule deer you know if you live in North America. Red deer are… epic. I don’t regret the extra hike; it was a pretty place, but probably more interesting to a city dweller than a country boy. In comparison to London’s better known deer park (at Richmond) Greenwich has some major advantages in terms of solitude and less crowding. Honestly, Richmond is only nicer if you want a longer walk with more people around. 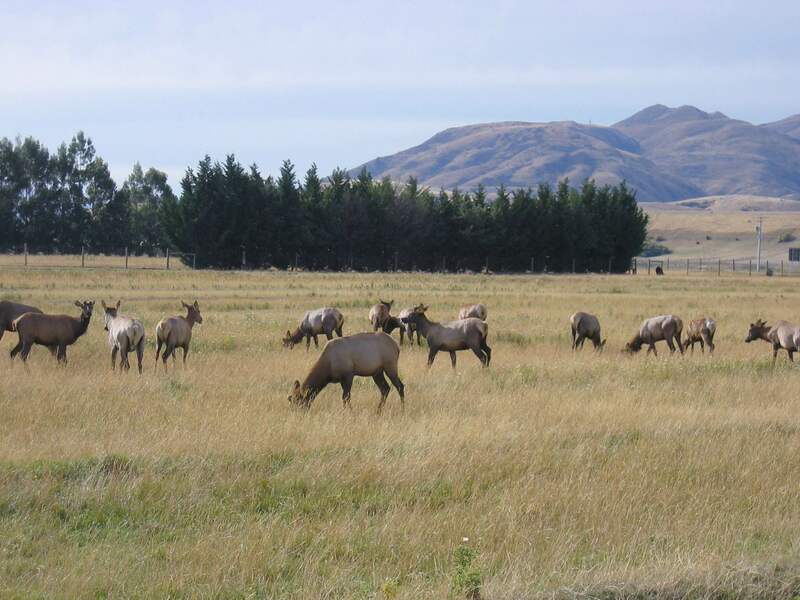 Unfortunately I did not get a good picture of the deer in Greenwich, so let me substitute a photo of some red deer does that I took in New Zealand. They really are magnificent animals. From almost anywhere in Greenwich Park you can see the observatory, and it is obvious the view there is going to be spectacular. 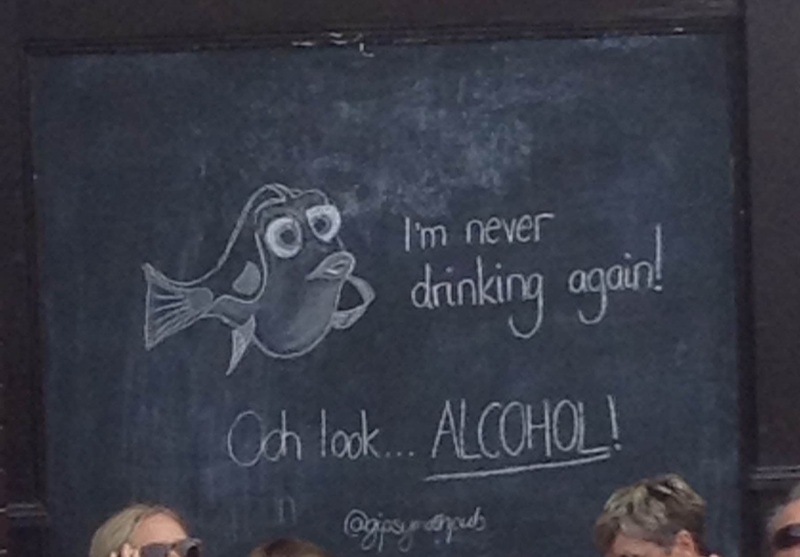 Well, it is. These next 2 photos are taken looking up at the observatory, then from the observatory looking down at Queens House, the National Maritime Museum, and Greenwich University. Looking uphill at the Observatory. One Tree Hill is out of the frame, over to the left. If this next photo looks familiar, it should be. 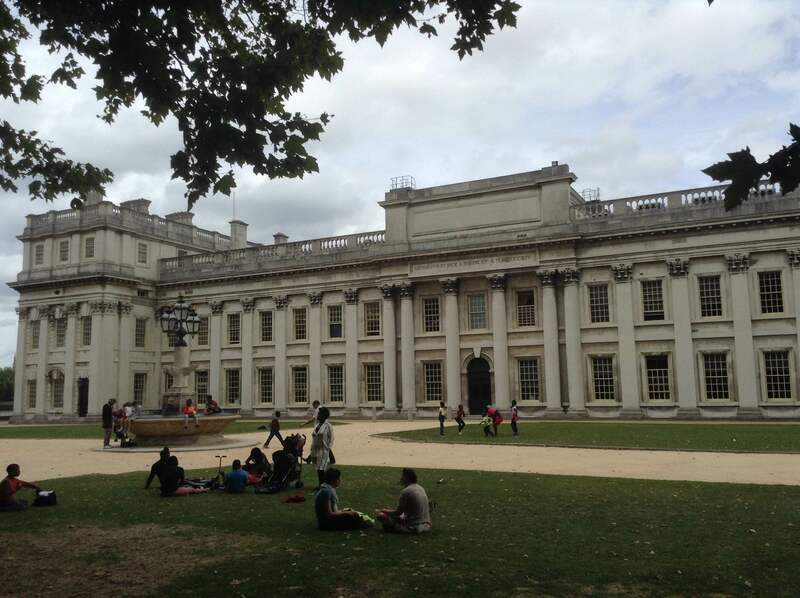 Or at least it will be familiar if you saw Thor-II (the Dark World), with the climactic battle taking place on the grounds of Greenwich University. Those 2 towers are the towers of the courts of Mary and Edward at Greenwich University and feature in the final battle scene. 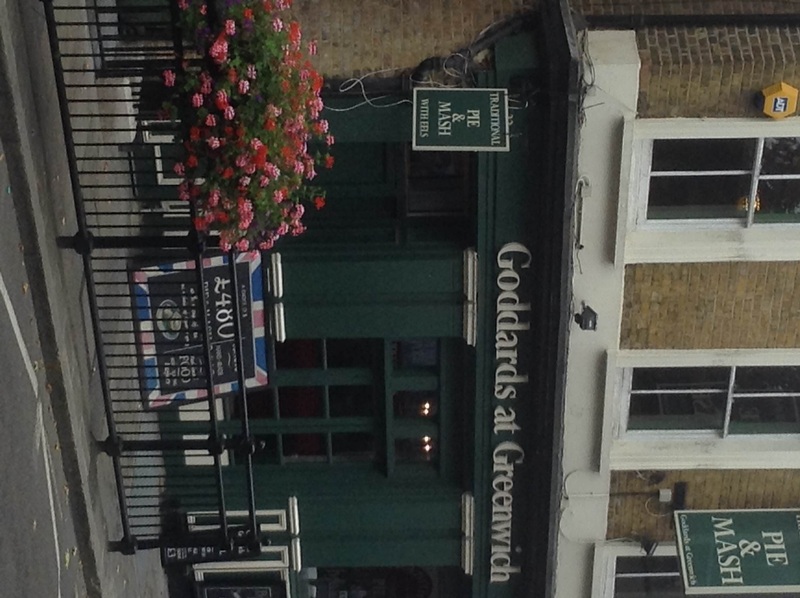 “East is east and west is west, and never the twain shall meet” (Kipling) Except in Greenwich…. The Shard (on the left) and the Gherkin (right center) are easily recognizable landmarks, as well as the dome of St Paul’s just to the right of The Shard. If the sun would have stayed out just a bit longer, this photo would have been as amazing as some I have seen on websites. Oh well, it is London, and the weather does change. Deal with it! Rather than retrace my steps back to the Park, The Mount became the place at which I started part 2 of my exploration journey, wandering the town itself. 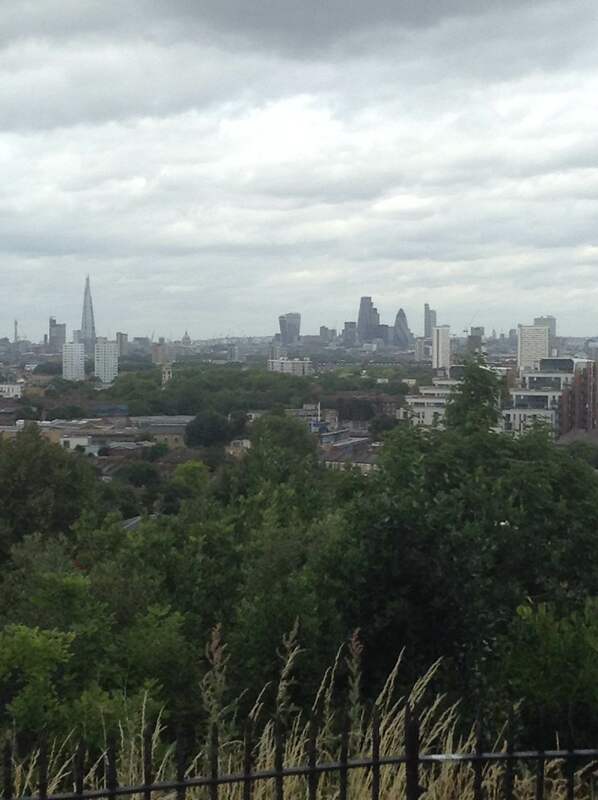 Looking out towards London, I saw a very small and steep path that led downhill into Greenwich, seemingly right into someone’s backyard. I couldn’t say no, I just had to walk it. At the very start of that walk, just leaving The Mount, I found something that stopped me cold. I should explain that I come from a family well versed in aviation, including pilots who flew in WW-II and the Cold War, and a family friend who was a Polish pilot flying/fighting with the RAF in the Battle of Britain. So as I started my walk down from the Mount and saw a small memorial with red poppies I instantly knew the significance. For those of you unfamiliar with what red poppies mean in England, the poem “In Flanders Fields” (John McCrae) was written about soldiers dying in WW-I, but the poppies he mentions have been adopted all through the UK as a way to commonly recognize & memorialize all the dead from all wars. So, when I saw the poppies, I knew what to expect. Or I thought I did. Because I know; in Flanders fields the poppies blow, between the crosses row on row. 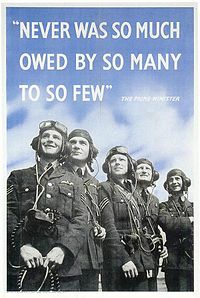 I won’t bore you with details of the Battle of Britain in WW-II. It suffices for me to say that in the summer and fall of 1940, when all the world seemed dark and England truly stood alone, life and death aerial battles were being fought every day right over this area. And this was one outcome. He was one. Just one. Just one of Churchill’s “the few”. I have to admit, this memorial is not as glamorous as what you can find elsewhere in London. It lacks the pomp and prestige of the Royal War Museum, or the size and the visual impacts of the impressive statues and monuments near Hyde Park and around London (and through all of England) dedicated to the wars, and to the dead. This is an incredibly simple, low key and subtle memorial to just one pilot. A plain marker in a roughly cut and unpolished stone, with just a few carved words. This is not even a burial location. It is just a memorial. And for whatever reason, it left a deeper impression on me than any other memorial I have ever seen. Anywhere. 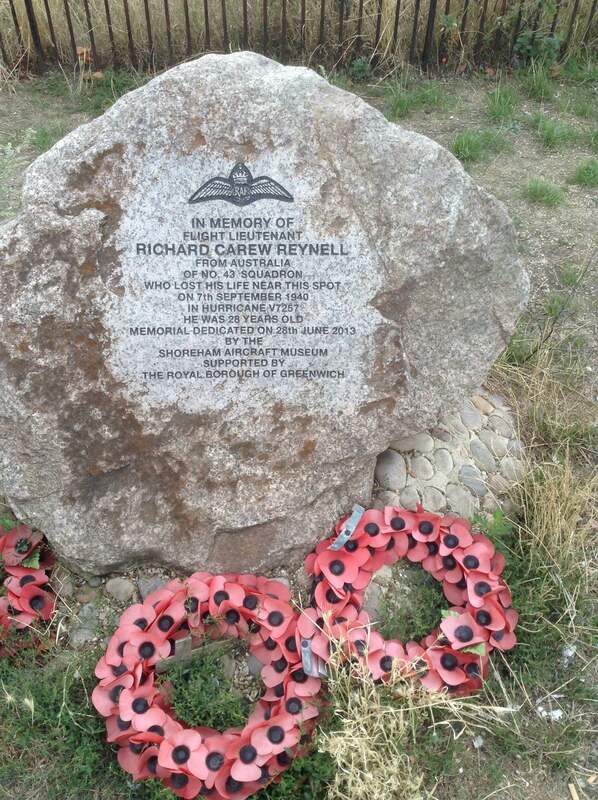 I salute you R. C. Reynell, and all of your brothers in arms. I’m inserting all of this here because when wandering around London, and really all of Southeast England, there are many reminders of what this land went through at the start of WW-II. Even as I walked in downtown Greenwich, at a random corner, I saw a sign on a building, built in the 1700’s, that was also damaged during the blitz. 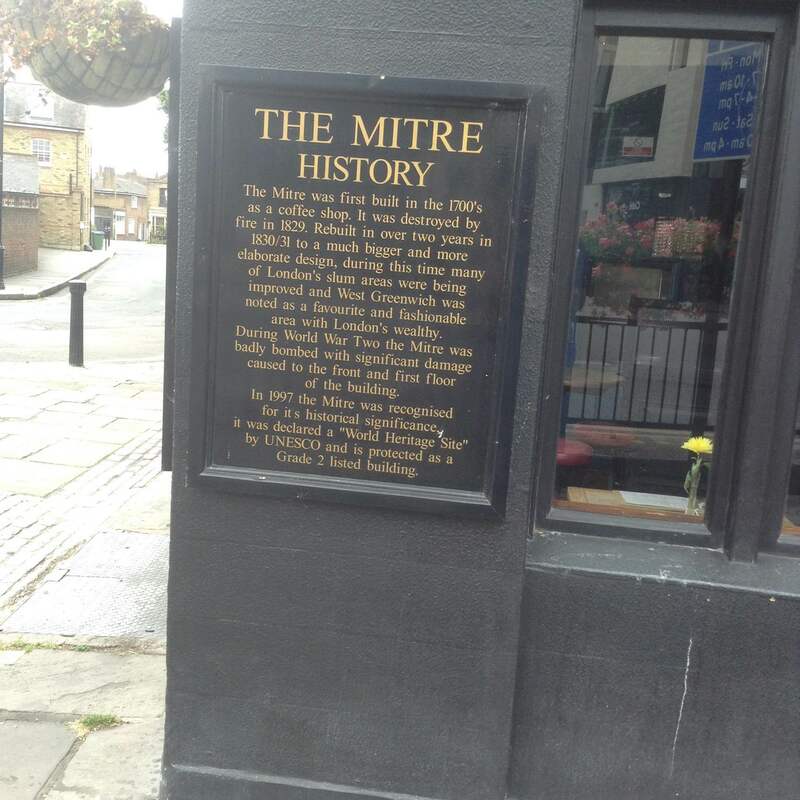 The Mitre, in Greenwich. A UNESCO world heritage site, built in the 1700s, and damaged in the Blitz. Greenwich is historical, there is no doubt of that. But do not be naïve, for a lot of England’s history includes blood. The Tower of London may be a great photograph, but a wise tourist will also learn what went on behind those walls. And the same is true in Greenwich. Anyways, once I had finished my moments of silence at the Reynell memorial, I walked the steep path down into the village and spent an enjoyable hour walking a totally random path around the western side of the town near the Park. The area was a delightful complex of small twisty roads, tight turns, and some wonderful small pubs, restaurants, and stores. I know that if my wife was with me we would have been long delayed there. I almost expected to see Mary Poppins floating into view here underneath a black umbrella. Yes really! 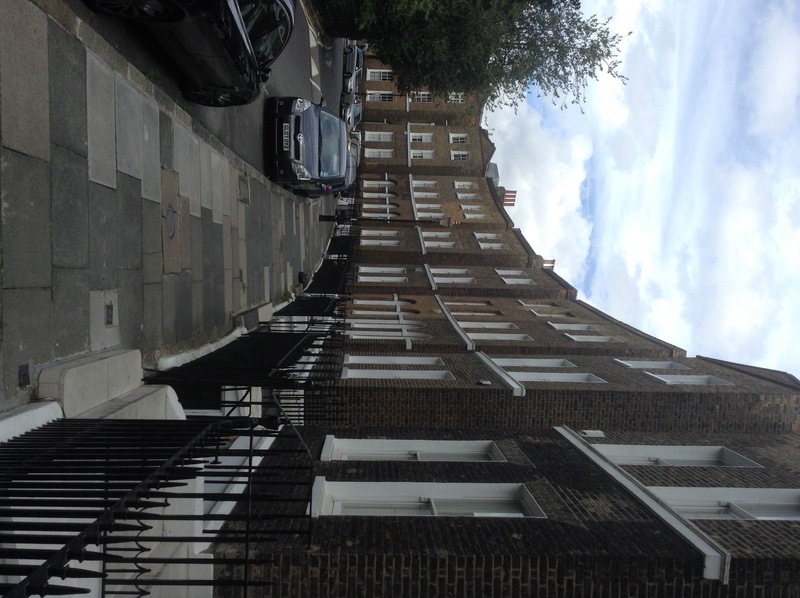 This is a real street (an alley) in Greenwich!! And also yes, “Pigsty” in English sounds the same as when we pronounce it in America. 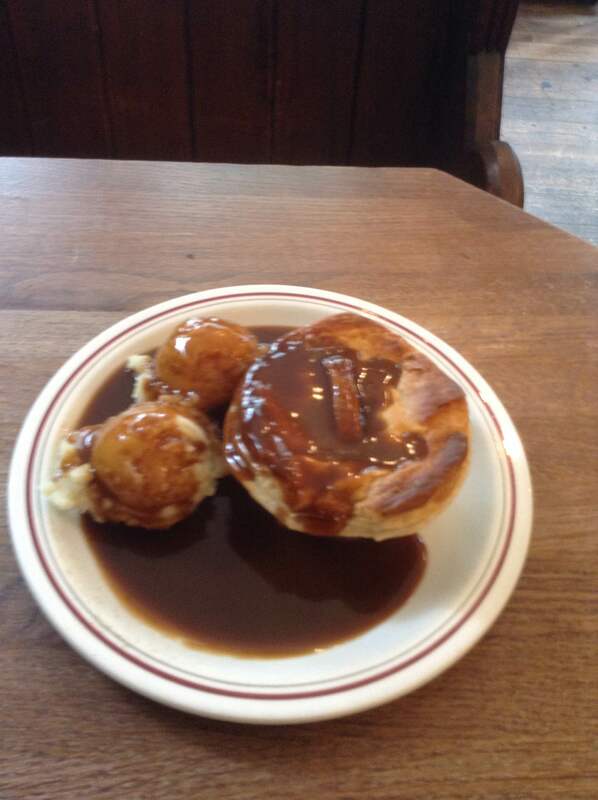 OK, so lunch is now done, I am suitably rested and it is time for phase 3 of my day, the historic sites, buildings, and monuments of Greenwich. But where to start? The answer to this was actually obvious. 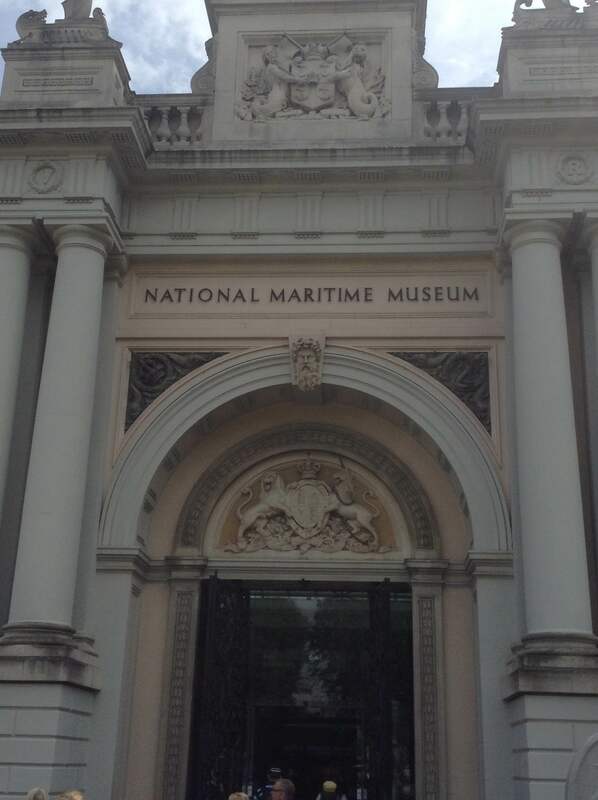 I had spent the morning and early afternoon wandering the Park, and from many places in the park the National Maritime Museum (NMM) stands out as an obvious landmark. It seemed like the logical place to start, and I knew exactly where it was. It certainly did not disappoint. 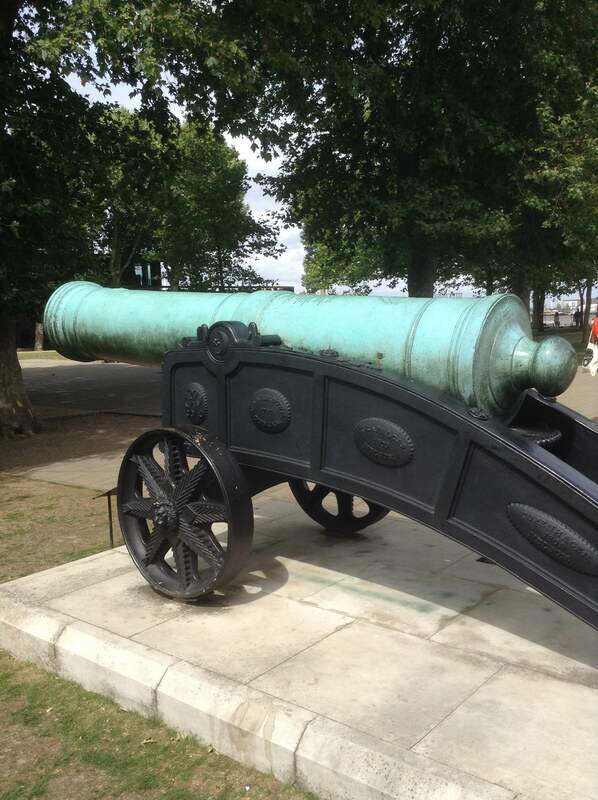 History – They really make it up close and personal here in Greenwich. It’s unavoidable. It’s part of the air and the water here. Several times during the day I would be startled, sometimes by items from WW-II, and at other times with almost nonchalant or offhand notices and placards or signs about Henry-VIII, Elizabeth-I, George-III, and Victoria. What is obvious in Greenwich is the reality of the history. These people we know only from movies or tales and legends in our books really walked here, stood here, saw these same sights. You can feel it. 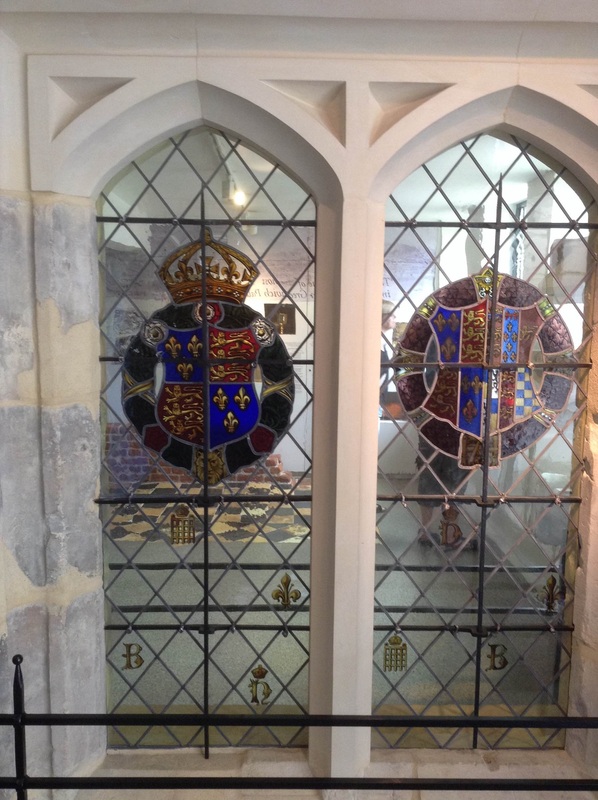 Original stained glass windows, on the left Henry-VIII with the red & white roses, and on the right with the heraldic emblems (designed by Henry) for his new Queen, Anne Boleyn. 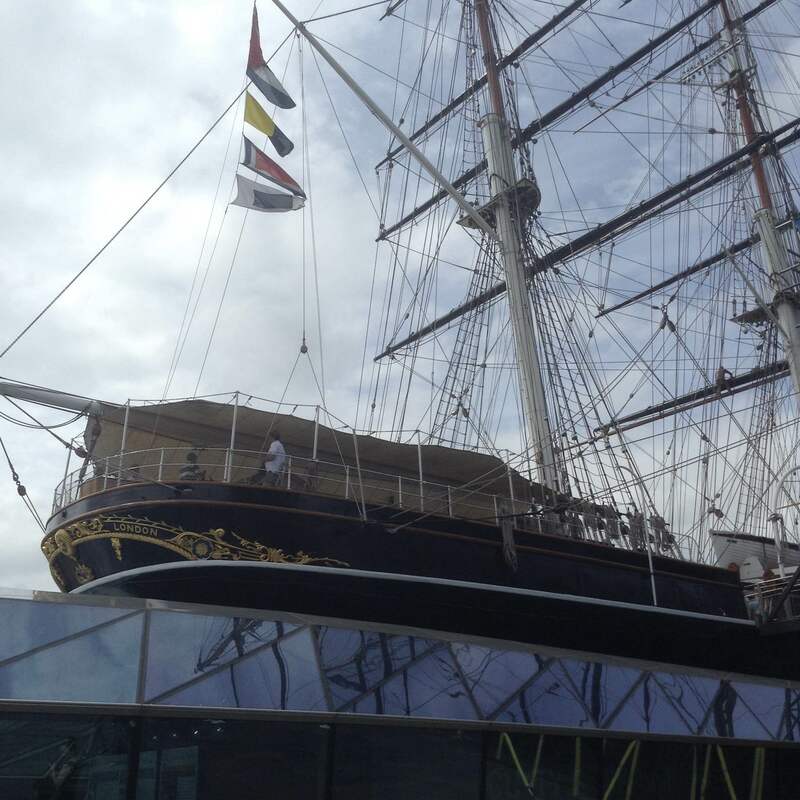 The famous Cutty Sark, a 210 foot 3 masted Clipper ship from the apex of the age of sail. She was launched in almost the same year as the first steam powered ships, the ones destined to replace her. 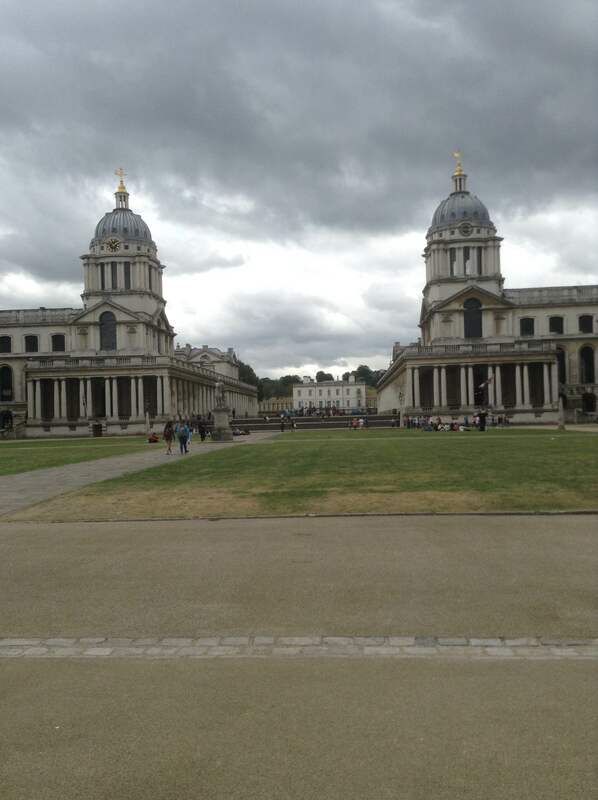 The twin towers of the courts of Mary and Edward at the University of Greenwich. Who, him? Really? No Raleigh. Sir Walter. Famous for (among other things) laying down his cape so Queen Elizabeth-I would not get her royal feet dirty. He was also a pirate, a brigand, a founder of the Virginia colony in America, a sponsor of tobacco, and just a wee bit uncontrollable. Walter was arrested multiple times, imprisoned in London Tower twice, and ultimately executed by King James-I in 1618. Part of the Royal Navy College, this building bears the name of its sponsor George-III on the doorway. No hard feelings though. Right? In summary, take the time and spend a day, or even an afternoon in Greenwich. It will not disappoint you. I promise. If you liked this post, I also spent 2 days walking thru London and finding some nice oddities with my blog at 2DaysWalkingLondon which is loaded with walking advice and (what I think) are nice photos of some of the best landmarks in London. 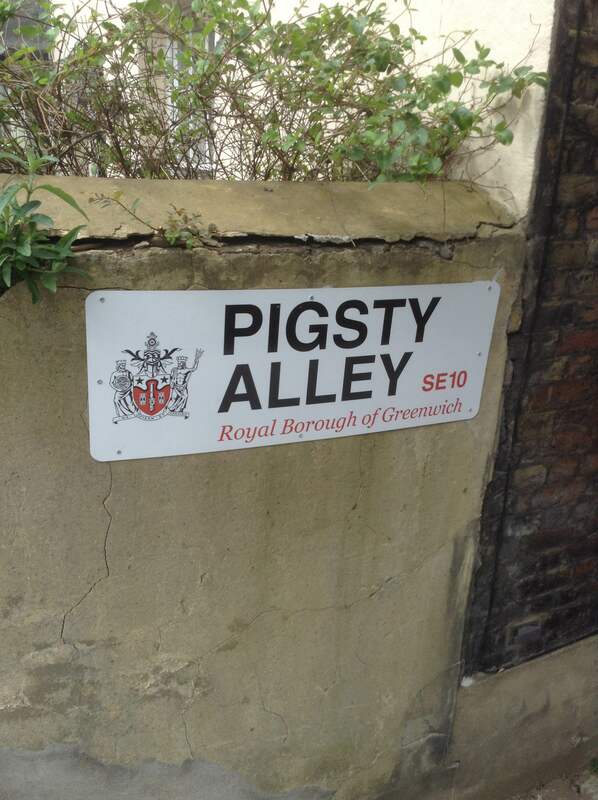 Pigsty Alley – love it. There is also a HaHa Road in Greenwich. Would you believe, have been back and forth from London 4 or 5 times though not yet made it to Greenwich. Sounds like you had quite the day though and I’m definitely going to have to plan for a stop when we fly back through. Love the amount of history, and I love that a day can be so fascinating and inexpensive at the same time. 4 pounds for pamphlets is a pretty good price to pay for a full day of culture and history! I’m fascinated by ancient trees as well, and it blows my mind that the same tree standing there today stood almost 500 years ago through so many stages of history. Crazy isn’t it! you think of all the history it would have born witness to could a tree have a consciousness and see!! Absolutely loved this. Have been in and around London so many times. 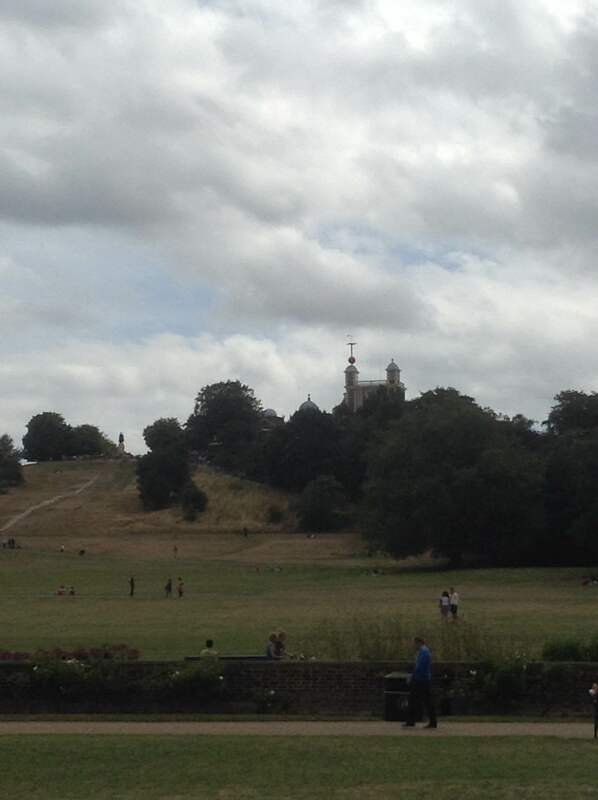 Visited Kew and other areas… but never the Greenwich side of the Thames. Definitely on my must do list! Wow! Looks like you had a great time exploring Greenwich too. 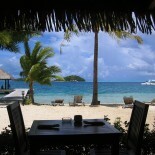 There’s really so much to see and do, as it seems you discovered. Just got used to using ‘liquor’ as a generic term for any UK sauce. Good to be corrected and specific. absolutely loving area the Greenwich . i think you have spent a great time in there. 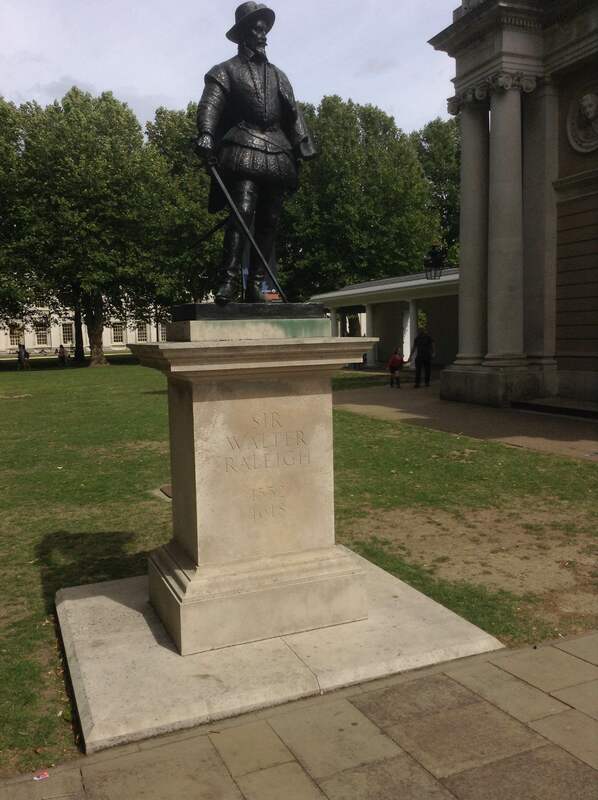 This entry was posted on August 19, 2015 by jlroehr in Passenger thoughts and tagged Cutty Sark, England, Greenwich England, Greenwich London, Henry-VIII, London, National Maritime Museum, Prime Meridian, Trafalgar, Walking Greenwich.